I really did feel part of the subway alumni on the Number 4 train from Grand Central to Yankee Stadium on Saturday night. We were packed in tighter than sardines, but despite the heat and the discomfort there was really a sense of an historic occasion. I had not been to the new Yankee Stadium as baseball leaves me pretty cold. The sight lines were magnificent, and they did a hell of a job of making a football stadium out of it. It was the house that George built, of course, as in Steinbrenner, and while he was never my cup of tea, it took some guts and vision to create one of the finest ballparks in the nation. I especially liked how helpful staff were. They wore large buttons saying 'Ask Me' , OK maybe a little silly, but it certainly helped me sort out where my seat was with the minimum of fuss. Compared to other stadiums the food and drink was not rip off prices either, no ten dollar beers or anything like that. I found the calorie list beside the menu a little off-putting. A double cheeseburger was over 1,000 calories it told. I passed. The Irish fans had colonized the stadium for hours before the kickoff. Is there any place in the country that the Irish could play that would not have a full house? Army support, unlike Navy in the Meadowlands, was never much in evidence. Maybe they knew what to expect. I got a queasy feeling on Notre Dame's first possession when they threw an interception and Army came back with a field goal. Shades of that awful game against Navy when we did essentially the same thing and threw away a first and goal situation on our first possession and were made to pay for it loomed in my mind. But Brian Kelly has done some job with putting steel into this team. Maybe the green jerseys helped too. Young Tommy Rees showed poise and class after the interception and led the Irish to a field goal, perhaps the most important score of the night. If they didn't kick that the ghosts of the Meadowlands may have perched on their shoulders. After that it was all the Irish as you could see the defense figure out, play by play, where the Army option offense was going. Two touchdown passes, both glorious ones from Rees, put the Irish up 17-3 at half time and the game, we knew was over unless Army scored on their first possession. They threw an interception instead, handing the game on the plate to the Irish. It was a warm feeling on a very cold night. By the 4th quarter with the Irish streets ahead I decided to take my leave. My 11-year-old nephew had seen his first Notre Dame game and it was a win, no certain thing these days. Back on the train to Manhattan he asked if I'd take him to the bowl game. I explained it depended on where it was, there was even a slim chance it might be back at Yankee stadium. 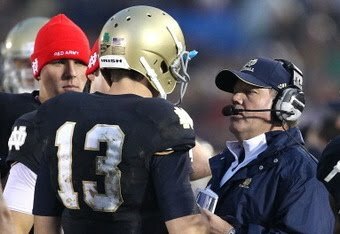 I have a feeling we will be going to a lot of bowl games together under Brian Kelly. Maybe even a BCS one at some point in the future. We can only hope and dream.